The iPod video is a device that was designed to view videos on, it's something that was a step up from the iPod photo and all of the previous iPod classic devices. The iPod video was released before the iPod mini, iPod Nano, and iPod Touch. This is a device that allows you to view photos, videos, and much more. You can also listen to music on the device as it comes complete with MP3 capabilities. 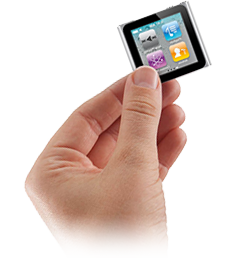 For the iPod video device, we commonly provide free diagnostic repair and inspection services. This allows us to inspect your device and see exactly what is wrong with it and provide this free of charge. Of course, you do have to pay for the packaging and return postage, but this is very minimal in compared to what you are getting in return. Select this repair if you have damaged or broken the screen on your iPod. This repair also covers white screens and inked screens. Select this repair if the click wheel on your device is not responding correctly or your are unable to scroll using the wheel. This repair includes the replacement of the click wheel assembly. Select this repair if your iPod battery is not lasting as long as it used to. Send it in to us for a brand new battery and a new lease of life for your device. This repair usually covers most unrepairable problems. This is for a replacement main board for your device. Sometimes despite our best efforts we can not repair some faults and in those cases we will offer you this repair as an option. Select this repair if your device no longer syncs with iTunes or does not charge via the bottom dock connector. Please select this repair if you are having problems with the sound coming from the headphone socket on your iPod. Common Problems include No Sound or Sound only coming from one channel. Select this repair if your sick and tired of looking and your old tatty iPod. This repair includes a full front and back housing that will make the device look like new. Please select this repair if you want to replace your old or damaged front casing on your device. If the device is showing a red cross or making clicking/whirring sounds, or skips through songs, or cannot be restored then the hard disk may be at fault. This price includes a brand new hard disk and installation. Please note all the data stored on the device will be lost as a result of the hard drive replacement.